Whether you are religious or not, whether you believe in a higher power or not, the horrific shooting at the Tree of Life synagogue in Pittsburgh, which led to the deaths of 11 peaceful worshipers, is an attack on every American. When James Madison wrote, “the Religion of every man must be left to the conviction and conscience of every…man to exercise it as these may dictate…This right is in its nature an inalienable right…” he was speaking far beyond his time and place. He was speaking to all of us through the centuries, to all Americans who hold our First Amendment rights so dear, and to all of us today who must stand and defend our fellow Americans against the senseless hatred that leads to violence. It saddens me to have to say it – because all honorable people already know it to be true – but religious bigotry has no place in America. Hating your neighbor because he is Muslim, Catholic, Baptist, Jewish, or Hindu is anathema to who we are in this nation. America is a better place when people of all faiths come together and lift each other up. We see that spirit every day in the Seventh District because this is a community where our differences really aren’t so different at all. This is a community where we celebrate what each of us brings to the table, and at the center of that table, regardless of your religious affiliation, is a belief in family, in working for your neighbor, and in the goodness of America. As we deal with the sadness and despair which certainly follows an attack like this, our response should be one of prayerfulness and love. When we teach our children that people of other religions are worthy of respect, we preach love, and we take one step closer to being who we want to be – the shining city on the hill where all are welcome to worship in peace. The U.S. Department of Commerce is reporting that our economy has grown by 3.5 percent in the third quarter. We haven’t seen back-to-back growth that positive since 2014! That news, coupled with the record low unemployment rate that I made note of earlier this month, in addition to the record setting 7.1 million job openings also reported this month, tells us that our economy is strong and getting even stronger. Consumer confidence is at an 18 year high and small business optimism is up. I have no doubt that this is a result of this Congress’ partnership with the Trump Administration to eliminate burdensome regulations and provide tax reform to American families and businesses. And while this news may not be as widely reported as we would hope, there are folks out there trying to get the word out. 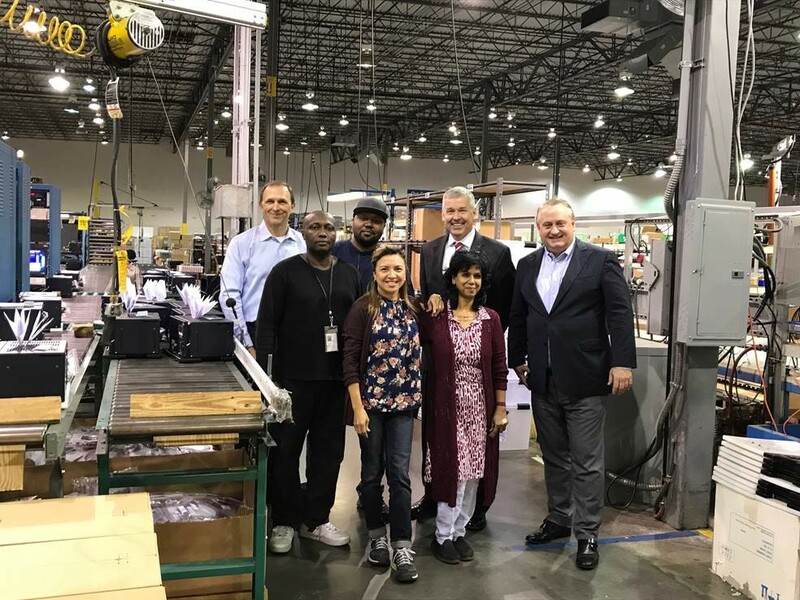 In fact, the Job Creators Network is currently on their second leg of their Tax Cuts Work Bus Tour to spread the news about how the Tax Cuts and Jobs Act has impacted our local businesses – businesses like Winton Machine in Suwanee that can now focus on their workers and producing quality goods thanks to tax reform. I was honored that the Job Creators network chose to stop in our area to allow Winton Machine to share their story and present me with the Defender of Small Business Award for recognizing the significance of the Tax Cuts and Jobs Act. 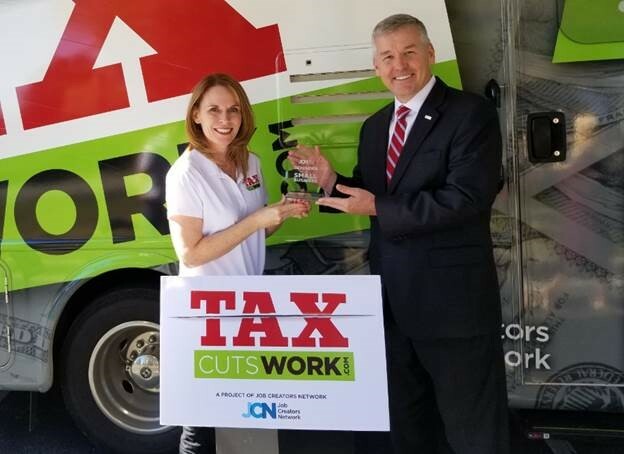 Congressman Woodall receives the Defender of Small Business Award from the Job Creators Network during their national Tax Cuts Work tour in Duluth. It is important that companies are given the tools they need to grow and be successful so that they can provide meaningful jobs for their workers along with high caliber goods and services for their consumers. A strong economy and a welcoming business environment should not be a partisan issue, and you can count on me to continue working with my colleagues in the House to achieve our shared goals. Too often, when we think about the businesses that keep our economy moving forward, we think only about those big brand names we see every day: Home Depot, Delta, Coca-Cola, Amazon, and more. But there are so many more with names that we don’t recognize which have a tremendous effect on our daily lives, and Alpha Technologies in Suwanee is one of those companies. For those of you who are not familiar with the work of Alpha Technologies, it is one of the largest broadband component manufacturers in the U.S., and I had the opportunity to visit with the team and see first-hand the work Alpha’s employers are doing to propel American competitiveness forward in providing advanced and cost-effective technologies in the telecommunications space. While you might have never seen its name, there’s Alpha Technologies equipment in all sorts of broadband infrastructure products that are likely in your home or office right now. While I am proud of the work that Congress has done through tax reform and regulatory reform to better support businesses’ ability to grow, expand, and be competitive in the global marketplace, the truth is that the real work happens here at home, as it is these industry leaders and workers who each and every day take the risk to open their doors and lead the way in innovation in their respective fields. I saw this entrepreneurial spirit during my visit with Alpha Technologies last week, and it is the same spirit I have seen in countless businesses across the Seventh District. I am grateful for these businesses’ role in not only providing jobs in our state but also in solidifying our community’s stronghold, and Georgia's status as a top state for business. A few weeks ago I reminded you that open enrollment for Medicare’s 2019 plan year has begun and will be open through December 7th. As you may know, during this period you can make changes to your current Medicare plan, whether that is altering your Medicare Advantage plan, changing your Medicare Part D prescription drug plan, switching to Original Medicare, or moving to Medicare Advantage. During this time, the Centers for Medicare and Medicaid Services (CMS) also advises folks to review any materials that your plan sends you, including the “Evidence of Coverage” (EOC) and “Annual Notice of Change” (ANOC), to make sure that your needs will continue to be met if your plan is changing. Of course, if you are happy with your current plan, you do not have to make any changes at all! During the open enrollment period, there are a number of resources available to help you find the plan that works best for you, and you can visit https://www.medicare.gov/ to compare coverage options, estimate plan costs, and explore services in your area. What’s more, if you would like free, personalized health insurance counseling through Georgia’s State Health Insurance Assistance Program (SHIP), a national program that offers assistance to those with Medicare, you can call them at 1-866-552-4464 or you may visit their website for more information. I know there are few decisions as important as deciding what medical coverage is best for your family, so I encourage you to take this time to review these and other available resources and reach out with any questions that you may have. As many of you know, drug pricing has been a topic of discussion for many years, and the good news is that this Administration has been relentless in its effort to rein in out-of-control drug prices across the board. From the U.S. Food and Drug Administration’s efforts to increase drug approval rates and competition among generic drugs under Commissioner Scott Gottlieb’s leadership, to Congress working together to send legislation to the Oval Office that prohibits so called “gag clause” provisions in Medicare and in group or individual health plans, we have seen numerous plans and efforts unfold to tackle this issue head on. In fact, President Trump and Secretary Azar announced plans just last week to give the Medicare program more tools to lower drug prices in Part B. For those of you that might not be familiar with the Medicare program, Part B drugs are typically administered to patients by physicians in a hospital or doctor’s office setting. Currently, Medicare has little ability to negotiate prices of these medications with drug manufacturers, and so President Trump’s proposal would give the Part B program much needed flexibility to ensure that the program is getting the best and lowest price possible for beneficiaries. Additionally, the President’s proposal seeks to establish a new pricing model to cut down on foreign free-riding by setting target prices based on the discounts given to drug companies in other countries. The U.S. Department of Health and Human Services has estimated that such a policy would result in overall savings for American taxpayers and patients of $17.2 billion, with out-of-pocket savings potentially totaling $3.4 billion. That said, the President’s proposal is just that – a proposal – and so health care providers, patients, stakeholders, government officials, and lawmakers must take this opportunity to carefully review the proposal and provide feedback. It is my hope that any final proposal simultaneously lowers Part B drug prices without decreasing patient or provider access and without stifling innovation. For that reason, you can be sure that I will continue to monitor these discussions closely to make sure that we get the best deal for our nation’s Medicare beneficiaries. The Hill. Trump unveils most aggressive action to target drug prices. You may not learn everything you need to know about an organization by its name, but in some cases, you can certainly learn a lot. Family Promise is one of those organizations. All the people at Family Promise do, and how each one of them go about it, is just that: a promise to local families. Family Promise consists of unbelievably kind and dedicated men and women who know just how important it is to keep families together while helping those in need find the resources necessary for long-term success. This past week, Family Promise of Forsyth held a ribbon cutting for a brand new day center, which will allow it to serve even more folks here at home. I’ve been fortunate over the years to visit with many folks throughout our community who have given of themselves to make Family Promise’s mission possible, as well as those who have benefited from it. That circle is what makes our community so special. Through our actions, we care about one another. We are not inclined to wait for someone else to do it. We certainly don’t ignore it. Rather, we join together with family, friends, and neighbors, and we make a difference one family at a time. That kind of character and the results it produces matters so much. It matters to the ones whose lives are changed, it matters to the overall health of our communities, and it matters as we take our message to Washington to serve as a model for others who may not be blessed with such examples. If you’d like to learn more about Family Promise (Forsyth and Gwinnett), please do so. I assure you that you’ll be inspired by the work, and if you are led to support Family Promise, I know those folks will be thankful for your partnership! For those of us in and around the Seventh District, we absolutely know the great work Gwinnett Tech is doing, but what we may not know is that others are noticing too. On Thursday, the Military Times again listed Gwinnett Technical College as one of the best colleges in the nation for its veteran services! Among career and technical institutions, Gwinnett Tech was ranked third in the entire country, and it remained in the top five for the second straight year. This also marks the third consecutive year it has moved up in the rankings. That pattern of success and improvement isn’t incidental or accidental. It reflects the deep commitment day after day, year after year from Gwinnett Tech’s President Dr. D. Glen Cannon, educators, staff, and supporters. Our servicemembers and veterans have unique training and experiences, and ensuring that they have all available resources to effectively transition back into civilian life and careers is a responsibility we take very seriously. They have given so much in service to America, and I’m so grateful we have the kind of community that is constantly striving to improve upon the way we can give back to them. When we can work together in such ways, the sky is the limit, and when you look around the place we call home, you can feel the optimism. Thank you to all of our military servicemembers, veterans, and those at Gwinnett Tech and beyond for all you do!